Excludes persons living on Indian reserves or settlements. Indigenous identity includes persons living off reserve who reported being an Indigenous person, that is, First Nations (North American Indian), Métis or Inuk (Inuit) and/or those who reported Registered or Treaty Indian status, that is registered under the Indian Act of Canada, and/or those who reported membership in a First Nation or Indian band. The sum of the categories included in this variable is greater than the total population estimate for Indigenous identity because a person may have reported more than one Indigenous identity: for example, a person could self-identify as both First Nations and Métis. Respondents were asked: “At what age did you have your first child?”. Source: CICH graphic created using data adapted from the Aboriginal Peoples Survey 2012, Public Use Microdata File (PUMF). http://www5.statcan.gc.ca/olc-cel/olc.action?ObjId=89-653-X2015005&ObjType=46&lang=en&limit=0 -accessed August 22, 2017. 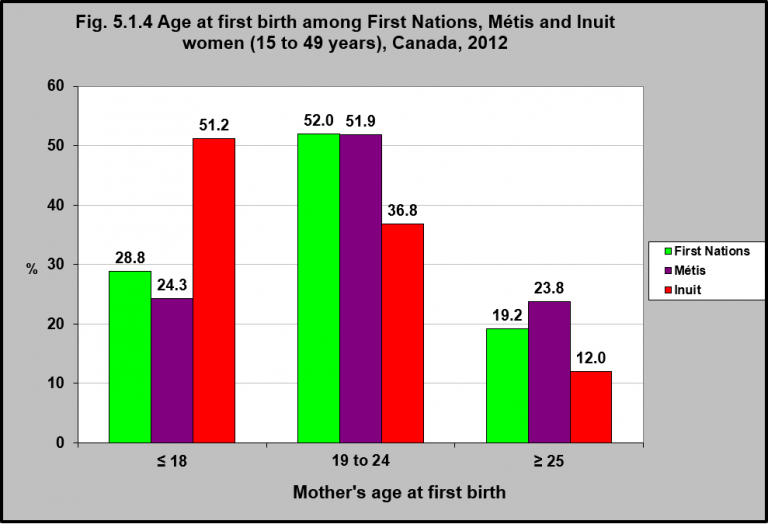 In 2012, the majority (52%) of First Nations and Métis women had their first babies between the ages of 19 and 24. The majority of Inuit women had their first babies when they were younger than 18. A smaller percentage of women in all three groups had their first baby over the age of 24. 1O’Donnell, V., & Wallace, S. (2011). First Nations, Métis and Inuit women. Ottawa, ON: Statistics Canada – Catalogue no. 89-503-X. 2Archibald, L. (2004). Teenage pregnancy in Inuit communities: Issues and perspectives. Ottawa, ON: Pauktuutit Inuit Women’s Association.